“NCIS: LA” is one of the few spin-offs that actually works. It’s far enough removed from the mothership and yet shares the same type of chemistry that takes the show away from crime-of-the-week to something a bit more meaningful. The third season DVD has some good storylines going for it, allowing for each character to get some screen time and more background. Previously on “NCIS: Los Angeles”, Operations Manager Henrietta “Hetty” Lange (LINA HUNT) has flown to Romania to confront the Comescu crime family who is after Agent Callen (CHRIS O’DONNELL). 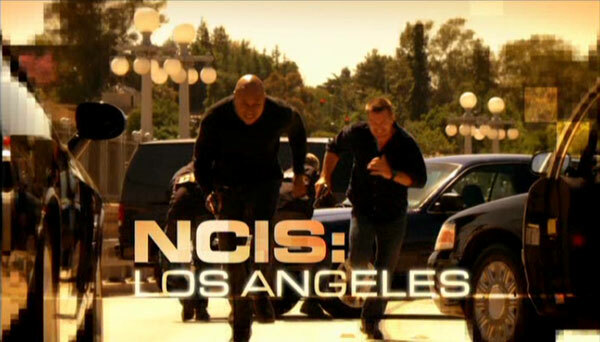 He and the other members of the team – Sam Hanna (LL COOL J), LAPD Liaison Detective Marty Deeks (ERIC CHRISTIAN OLSEN) and Kensi Blye (DANIELA RUSH) –, against the orders of NCIS Director Leon Vance (ROCKY CARROLL) and Interim Operations Manager Lauren Hunter (CLAIRE FORLANI), they resign their positions and head to Prague to save Hetty. The rest of season 3 is fairly procedural with case-of-the-week episodes as the NCIS crew tackle new and more perplexing murder cases, terrorist attacks and such, though there are a couple that break the mold and help better define some of the other characters like Hanna’s undercover mission in Sudan for the CIA or Blye being accused of murder by NCIS Assistant Director Owen Granger (MIGUEL FERRER), a bit of a governmental douche who has a past (professionally) with Hetty, and must go on the run to clear her name (the plot involves the murder of her father). Deeks also gets an episode when he mistakenly shoots an unarmed man while on a stakeout and his subsequently fired from the LAPD. I admit that early in its first season, I wasn’t much a fan of “NCIS: Los Angeles” mainly because it was a far cry from the mothership series, however, with more time under its belt and settling in to its own visual style, I kind of appreciate it’s not a mere copycat unlike, say, “Criminal Minds: Suspect Behavior” which thankfully CBS rightfully axed before it got a second season… I enjoy the characters and even the cliché storylines or scenes that crop up in every other episode (how often is a victim or suspect’s door unlocked, allowing agents to enter?). It might not be as well polished as “NCIS”, but “NCIS: LA” is a fun show that allows itself for some great storylines but doesn’t take itself too seriously. The acting won’t win any awards though the chemistry shared between the cast is great and has really gelled into its third season. It’s compelling enough television that it’s easy to see why it’s gained viewership, although it helps that the 20 million/week viewer lead-in would help, and it has the potential to stand on its own as quality network television entertainment. Like other TV on DVD releases from Paramount, this comes with a side-sliding slip cover and the 6 discs are contained in a standard DVD case for optimal shelf saving space (vs. the wider cases “NCIS” has). There is a selection of Deleted Scenes for the following episodes: ‘Lange, H.’, ‘Betrayal’, ‘The Debt’ and ‘Blye, K. Part 2’. Raise the Roof (9:09) – This featurette provides info on expanding the NCIS: LA world with new sets including a gym, firing range and armory. Dishing… with Barrett and Renee (17:24) – The two actors, Barrett Foa (Eric) and Renee Felice Smith (Nell), answer various questions over a glass of wine and eating grapes, cheese and bread. Aligning the Stars (14:11) profiles the show’s technical advisor, Osama Shofani, a retired member of the Marine Corp.
Carmageddon (12:02) shows how the different car explosions were performed. Episode Commentary – Co-stars Daniela Ruah and Eric Christian Olsen provide a commentary for ‘Neighborhood Watch’. As one would expect, this is a light-hearted affair as the pair have fun chatting about the episode providing some insights in between the joking around. Investigating Season 3 (28:19) is a behind-the-scenes featurette covering everything about the third season and looking back on the progress made in the stories and characters. Surf and Turf (7:17) takes a look at the cross-over episode with “Hawaii Five-O”. And speaking of which, the “Hawaii Five-O” Cross-over Episode, ‘Pa Make Loa’, is also included. 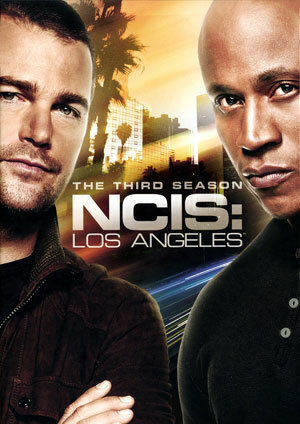 Paramount releases “NCIS: Los Angeles” The Third Season on DVD with a nice and bright looking 1.78 anamorphic widescreen transfer. While it is still standard definition (the studio released season 1 on Blu-ray but apparently due to low sales, dropped it) and doesn’t quite have the detail a HD transfer would, it still looks really good with vibrant colors and minimal amount of artifacting. The Dolby Digital 5.1 track is actually not bad. There’s a fair amount of action/chase scenes which especially showcases the lossy track but even during the more dialogue-driven moments, it still is strong. 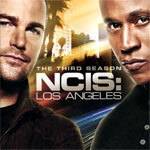 Overall, “NCIS: LA” is one of the few spin-offs that actually works. It’s far enough removed from the mothership and yet shares the same type of chemistry that takes the show away from crime-of-the-week to something a bit more meaningful. The third season DVD has some good storylines going for it, allowing for each character to get some screen time and more background. The audio/video transfers are in line with what’s expected and there’s a fair amount of features which fans will enjoy.